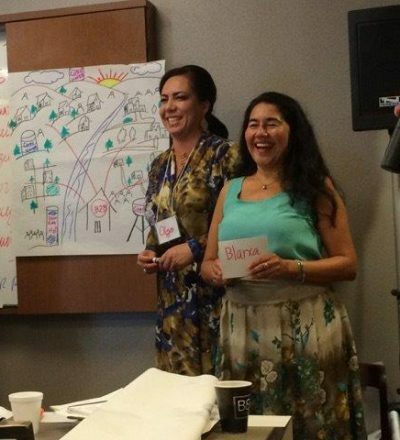 Olga Morales, RCAC regional environmental manager and Blanca Surgeon, RCAC rural development specialist, conducting leadership training. Help make a difference in rural communities across the West. Apply today! Our board and staff are committed to provide training, technical assistance, financial resources and advocacy to help rural communities throughout the West achieve their goals and visions. We work in diverse and low-income communities to increase access to affordable housing and safe drinking water, promote economic opportunity and job creation, and provide financing for community and economic development projects. At RCAC most program staff have the opportunity to travel, work in a flexible environment and define and develop their own work plans to achieve community driven outcomes. Though our staff works in 13 western states, we celebrate teamwork with open door access to peers and senior leadership. We offer competitive salaries, benefits including retirement and help with student loans, and offer growth and advancement opportunities within the organization. We have a keen interest and desire for our staff composition to reflect the diversity of the communities we serve. Check out our open positions below and feel free to contact Rachel Mulligan at rmulligan@rcac.org, or (916) 447-9832 ext. 1054. Our application process is mobile friendly! Are you an economic development professional with a passion to help other succeed? Are you a people person with great leadership skills? Check out this exciting opportunity. Do you have water, wastewater or solid waste experience? Do you understand the management and financing aspects of utility operation? Do you want to work with an organization that is passionate about rural communities? Check out this job description apply today! Do you have drinking water experience? Do you understand the utility operations and regulatory requirements for small groundwater systems? Do you want to work with an organization that is passionate about rural and tribal communities? Click here to view the full job description. Put your leadership and project management skills to work in small, rural communities. You’ll work with water and wastewater systems to help them become sustainable and support improved community health. Click here to view the full job description. Do you have water, wastewater or solid waste experience? Do you understand the management and financing aspects of utility operation? Do you want to work with an organization that is passionate about rural communities? Check out this job description! Are you looking for a career that makes a difference in others’ lives? Do you believe in creating vibrant rural communities? Put your loan underwriting and administration skills to use as a loan officer! Check out the job description and apply today! Do you have a deep commitment and understanding of the rural west? If so, click here to view the full job ad and instructions on how to apply. If you’re a detail oriented, people person with strong organizational skills, we want to meet you! Our team is looking for an administrative specialist to provide support to various teams. Want to know more? Here’s the job description. RCAC employees may qualify for student loan forgiveness.